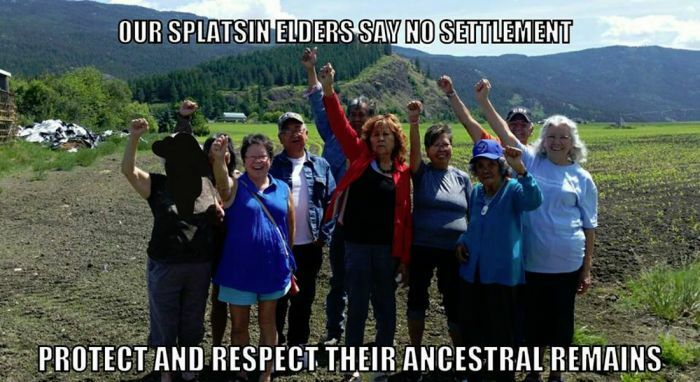 VANCOUVER - Join us in solidarity on Sunday July 10, 2pm at Spartacus Books, 3378 Findlay Street in East Vancouver to support Splatsin Elders and community members who are protecting their ancestors' final resting place. Jody Leon of the Splatsin says, "The government and Splatsin Chief and Council are putting to vote for the sale/settlement of ancestral burial ground that was illegally transferred to a settler who is using the land to farm on top of our ancestral remains. This is a human rights violation and the Heritage Act and the Cemetery Act do not protect Indigenous ancestral remains. Urgent help needed to promote action to get the ancestral graveyard in the lands of the Splatsin people to be honoured and protected." They will be raising funds to help bring elders and spiritual leaders together on July 16, at the Splatsin referendum vote location, to protect sacred burial grounds from being sold. Splatsin elder Nathan Kinbasket will speak on what's happening with entertainment by poet Mitcholos and more speakers and performers to be announced.